Heinrich Friedrich Wilhelm Barella was born in Soest, North Rhine- Westpahalia on Jan. 3, 1819. His grandfather had emigrated in 1760 from Milan, Italy where the family was well connected,educated and well to do. He (the grandfather) married a woman from the Simon family of Paderborn to the west of Soest. In his late teens Heinrich entered the Royal Foundry in Magdeburg, Saxony where he served a four year apprenticeship. 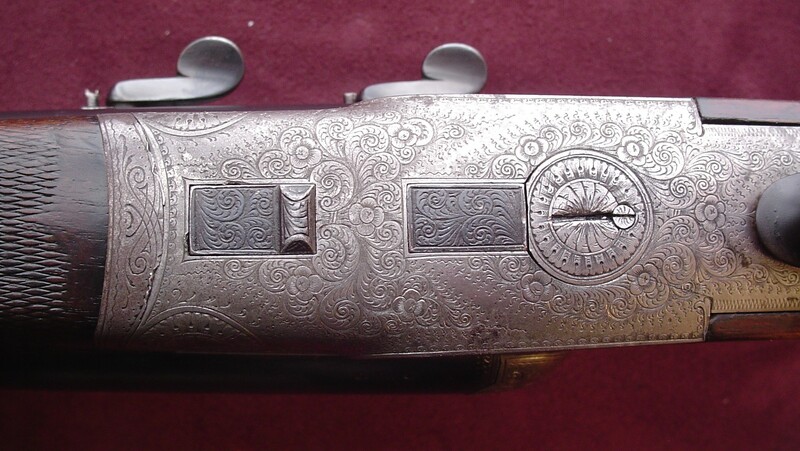 In 1844 he founded his first gunshop in Magdeburg “H. Barella, Königl. Hofbüchsenmacher”. 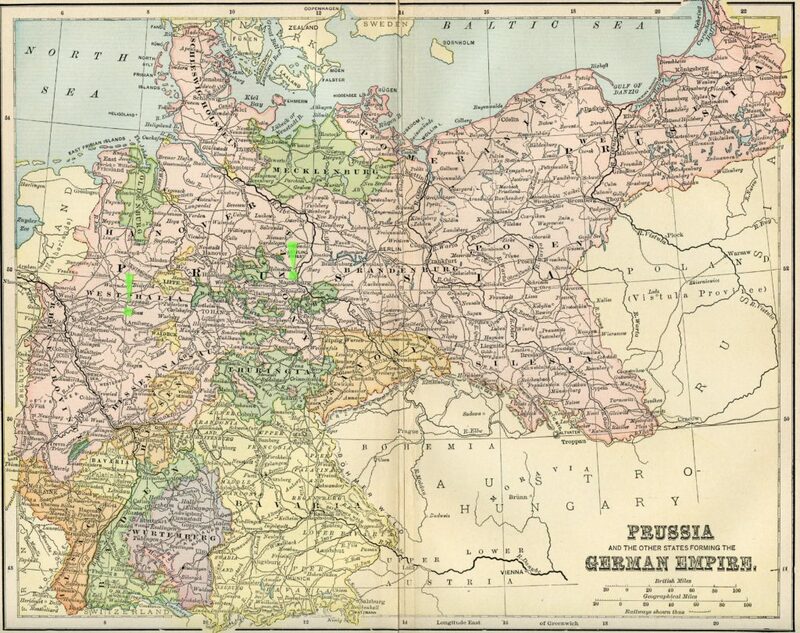 The bright green arrows and squares show the locations of Soest and Madgeburg, where Heinrich was born and where he opened his first shop. 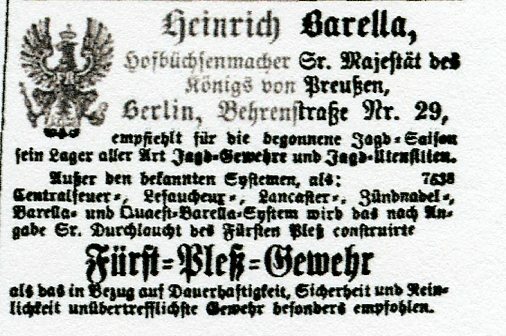 An advertisement from the June 3rd, 1863 edition of the “Landwirthschaftliches Anzeigeblatt” printed in Berlin which shows his address at Laubenstrasse 9. About 1860 Heinrich was recognized by the Royal Prussian court for his high quality products and opened a second shop in Berlin on Laubenstrasse 9. Evidently he changed locations in Berlin several times as an 1866 advertisement gives his shop address as Behrenstrasse nr. 29. Later he moved the shop to Mohrenstrasse nr. 61 to be nearer to the Royal Court. An advertisement from the Oct. 6, 1866 edition of “Beilage zur Illustrirten Zeitung”. 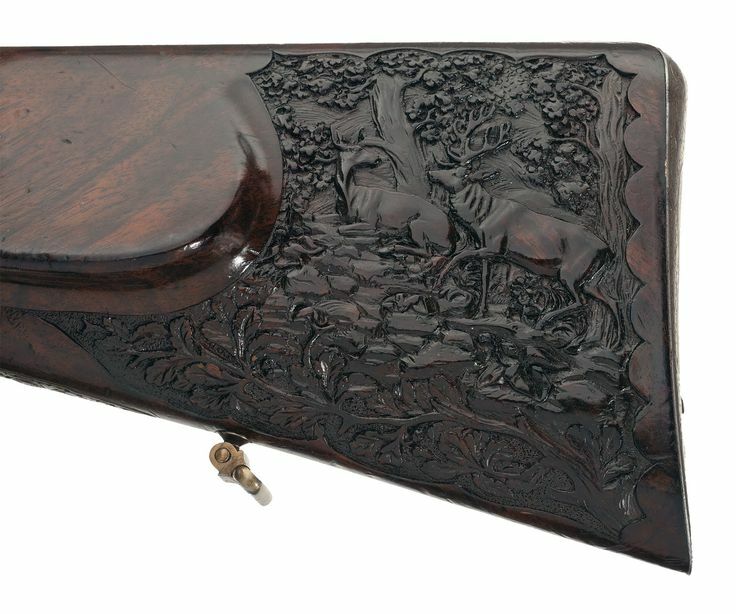 In the early 1860’s Heinrich developed a “quick loading” conversion of muzzle loaders to breech loaders using a paper combustable cartridge. 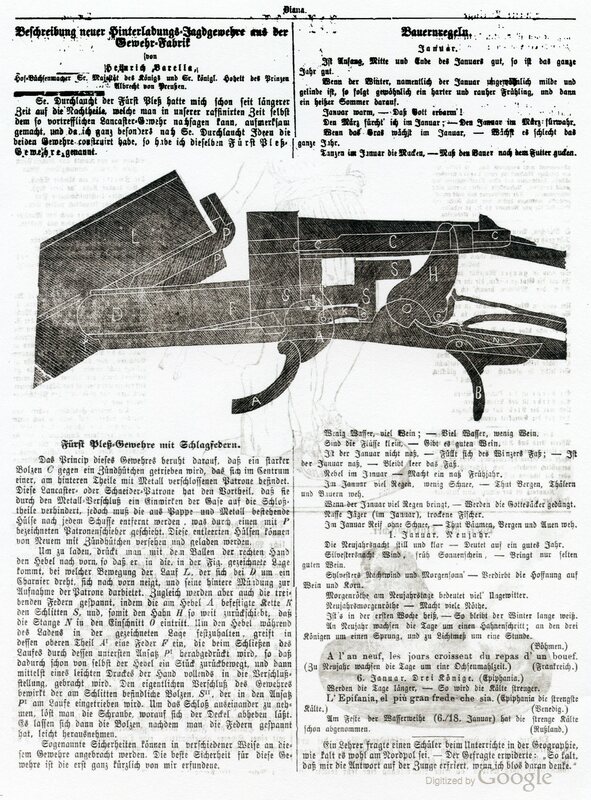 The following article is about this double barrel rifle conversion and gives his address as both Madgeburg and Berlin and is from the Leipzig “Illustrirte Zeitung” of Oct. 7, 1865. 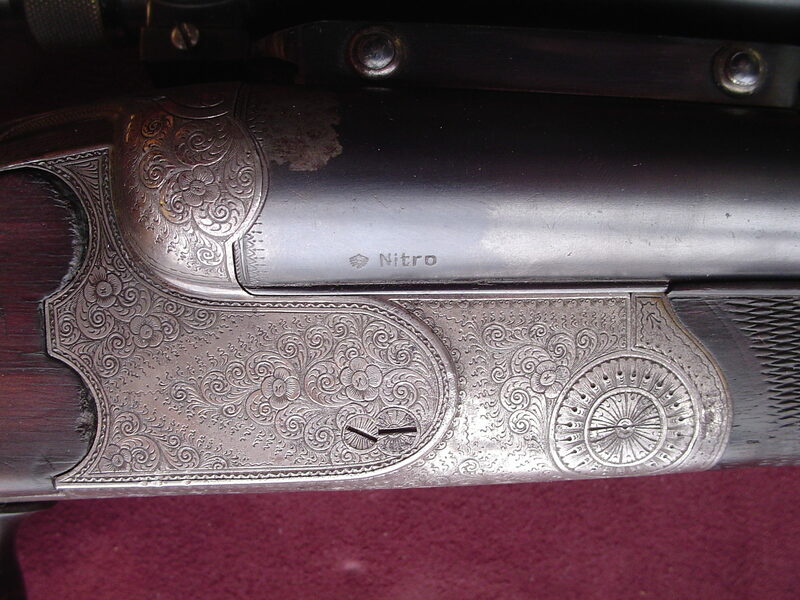 By 1868 he had embraced the successful self contained cartridge and had developed a break action (kipplauf) gun with an underlever and single bite lock up. An article detailing this action appeared in the “Diana” section of the “Der Pferdefreund” of January 1868. This he advertised as a Fürst Pleß gun but it is not based on the Berger coil spring action but on the hammer driven action we now call the Daw. To see more about the Berger design click Here. According to the 1873 Handbook of Industry in 1872 the Barella shop had 50 employee’s. Heinrich maintained a connection with his grandmothers home of Paderborn and his second wife was Luise Leue from that City. 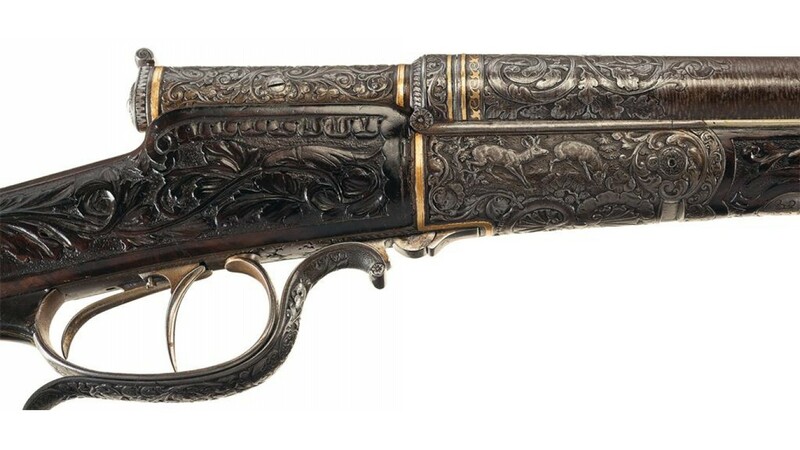 One of Heinrich Barella’s apprentices was a nephew of Luise, Heinrich Leue (1837-1897) who later became a well known gun maker in his own right who also had a shop in Berlin. 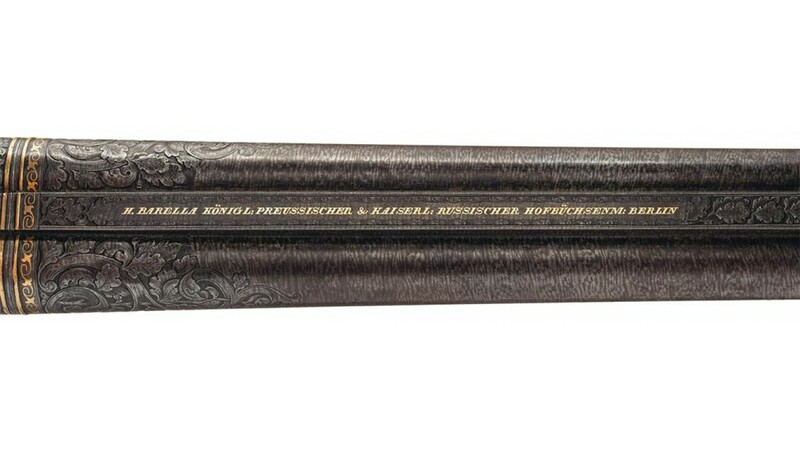 Heinrich did not have any children of his own but his younger brother August Barella was active in the business and August’s son Matthew took over the businss in 1893 when Heinrich passed away. The business remained open until 1931 when Matthew’s son Max declared bankruptcy. 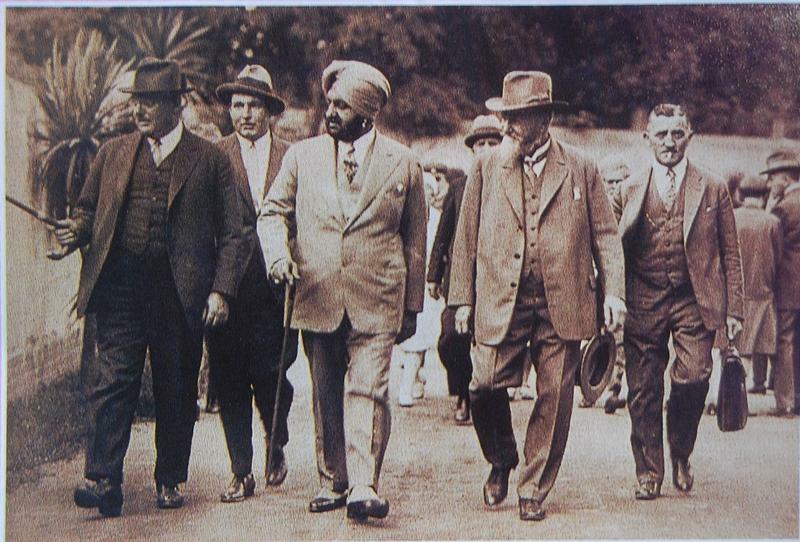 From left to right, the gentleman with the cane is Max Barella, The man with the fedora is Peter Barella (Dec. 1, 1885- Jan. 25, 1980) the gentleman wearing the turban is the Maharaja Bhupinder Singh,the ruling Maharaja of the princely state of Patiala, India, the gentleman with the beard is August Barella- Rich Barella’s Grand Father, the man with the briefcase is also one of the Barellas. 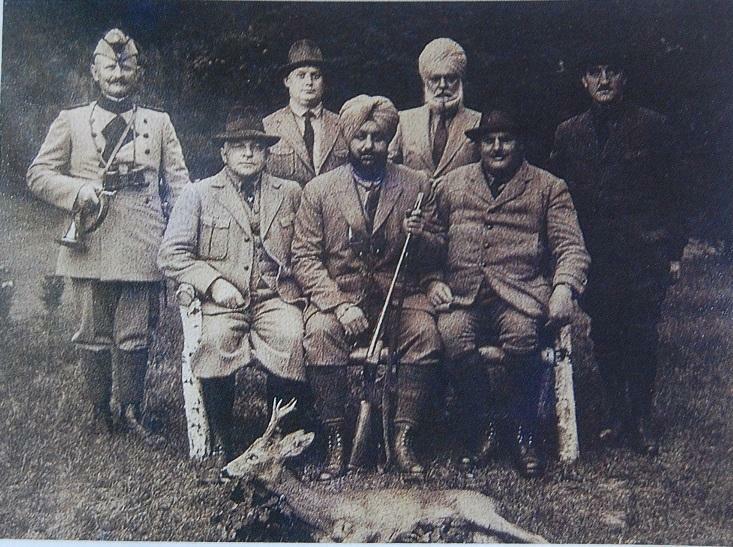 Richard Barella belives that the gentlemen sitting on the bench with the Maharaja are members of Heinrich Barella’s second wife’s family the Leues. 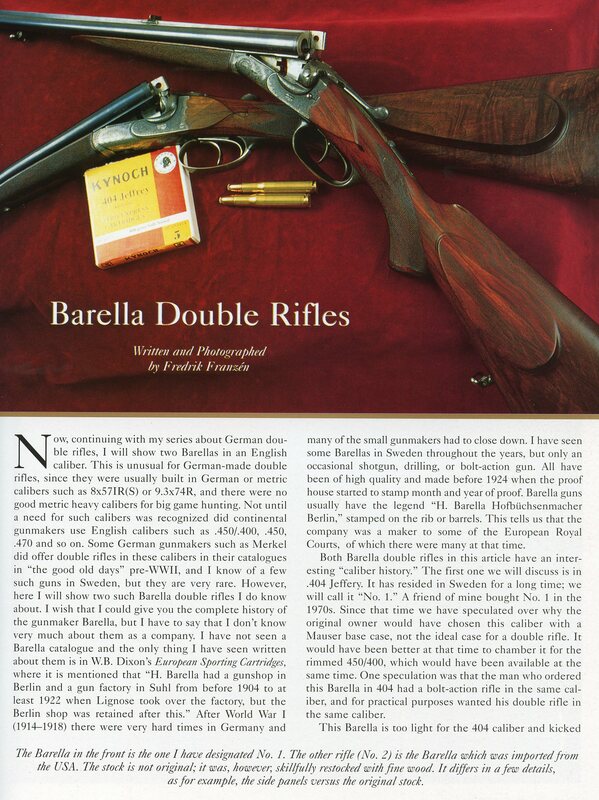 The great web site https://shotguncollector.com has a pdf of a Heinrich Barella Catalog availible. Click Here to view that Catalog. 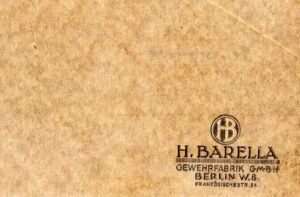 On August 5, 1924 the firm H. Barella, G. m. b. H. of Berlin was issued DRP nr. 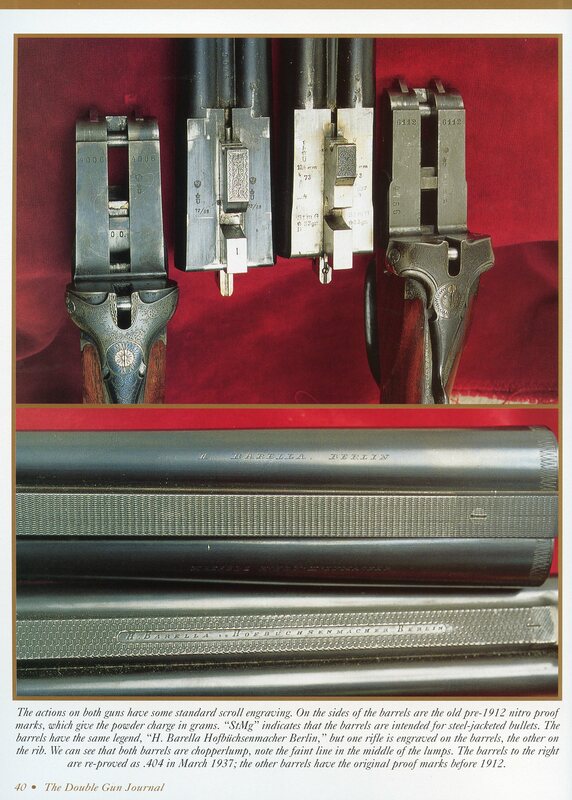 400359 for a safety for a hammerless gun. This is a sear blocking safety. 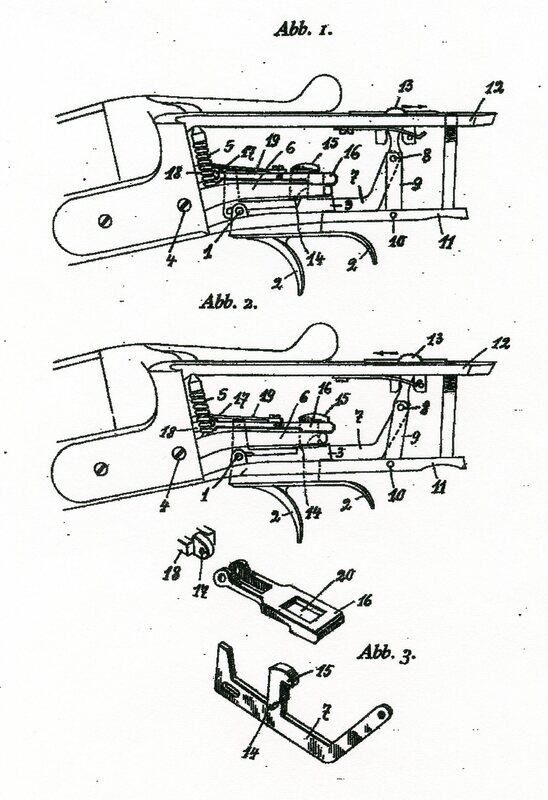 Below is the drawing for that patent. 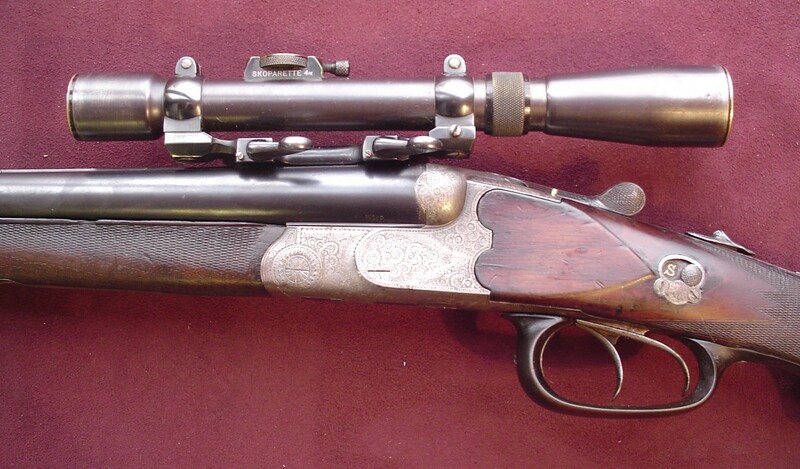 Below are views of a early 20th Century Barella drilling in 20 ga. and 8x57mm with an interesting scope mount. The following preview article appeared in the Summer 2003 issue (Vol. 8, Iss. 3) of the Double Gun Journal and is courtesy of Fredrik Franzén and Daniel and Joanna Côté. A back issue with the full article is available from the Double Gun Journal.